Those of us living in the more temperate parts of the country miss out on a very different fishing experience: ice fishing. This is a winter pastime that thousands of anglers enjoy in more northern regions. It`s also a great away to enjoy winter RV fun. This is when you can park your rig at a remote site, trek out onto the ice and enjoy a day wetting a line in hopes for a catch of the day. iRV2.com member Up North shared what is called an Ice Castle, which is essentially a RV travel trailer designed for ice fishing. It can also be used for camping in the summer. Since I know nothing about this realm of the sport, he showed me some of his equipment. He has some very short fishing rods, a six-foot long ice auger for cutting holes in the ice, and a portable tent, which folds down into a little sled that he pulls out onto the ice. 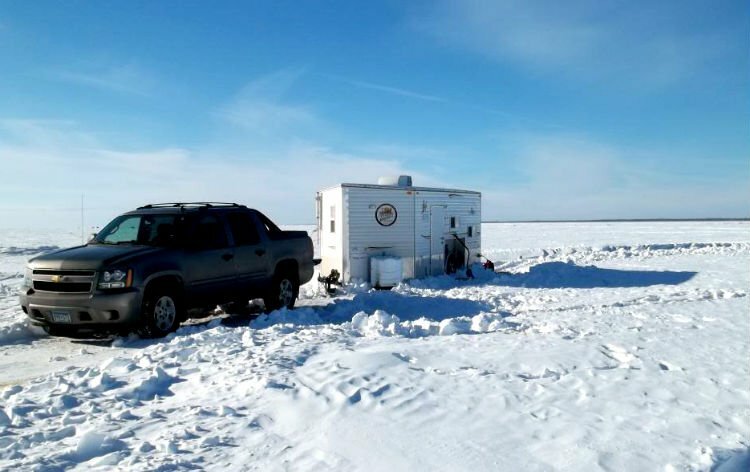 Ice fishing is when you can park your RV at a select site, trek out onto the frozen lake and get your catch of the day. He told me that once the ice is frozen about five or six inches thick, he would dress warm, pull the sled over the ice and drill a hole with his auger. He would then set up his tent and fish. For most kinds of ice fishing anglers use a decoy. Simply lower these little lures in the water and start jigging. This serves two purposes. First, it attracts the little fish that are deeper and secondly, big fish may think the decoy is a smaller fish that they can eat. Also, pike fishermen will cut a two-foot wide hole then jig the little decoy in the water. When a pike comes up to grab the little fish, they stick it with a spear. This creates lots of excitement. The fish thrashes around that shakes the spear (and the angler) around the frozen, slippery surface. Like most kinds of fishing, there are some hazards to consider. In very cold weather, frostbite is possible and snow or ice storms can arise. If you’re not familiar with the lake, be aware of ice conditions and thin ice. If the ice is under two inches stay away. 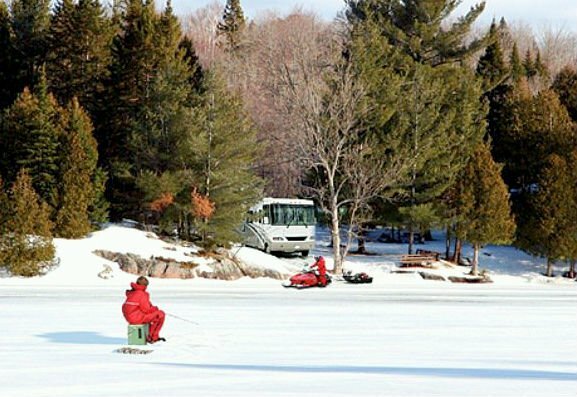 A lot of cold weather communities with good fishing lakes (and even colder winters that provide a thick layer of ice that can support a lot of weight) have ice fishing derbies. They draw thousands of anglers who set up all kinds of structures. Some anglers modify pickup campers and ice huts are also popular. Some even feature sleeping areas. During a harsh winter when it’s hard to do anything outside, fishermen relish this pastime. Anglers also use fish finders (the same type for boats) to find fish and structure. 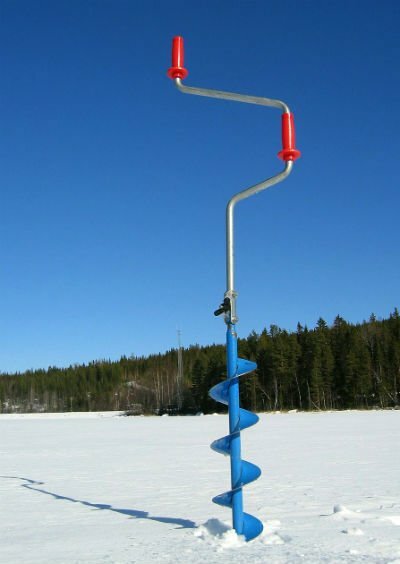 Another strategy is to set up a number of different holes with ice fishing rods set up over each one. When the fish strikes, a flag goes up, indicating that a fish has taken the lure or bait. Craig told me a great story about a trip he had taken. He and his wife, Connie, went out on the ice with another couple. They were fishing in a four person tent. The fishing was a little slow, yet they were enjoying conversation and some cocktails. Suddenly, something big and hairy splashed out of the hole and started thrashing around the tent. The first people out of the tent were their wives. They were soon followed by their husbands, and lastly by an irate muskrat! Preparing for winter camping is a must. Ice fishing, too, takes some planning and all the ideal gear for an enjoyable experience. Most importantly, closely monitor weather forecasts and weekly ice fishing reports as it’s extremely important to ensure safety. To many of those that haven’t tried ice fishing, it seems like a sport not for them. However, there is a lure (pardon the pun) that attracts many out onto the ice every winter that may be hard to explain. For me, ice fishing can be a quiet experience where one enjoys the natural beauty and solitude. For others, it can be filled with camaraderie, especially on weekends on popular lakes. As with any outdoor activity, pick a day to your liking. A windless day actually can be quite comfortable as one attends to drilling holes, checking tip ups or jigging, enjoying a favorite beverage (cold or hot) and of course the surprise of what one will pull through the hole next! Bringing home a catch is sometimes secondary to the activity itself.